another lunch: MTM - Chicka Chicka Boom Boom! 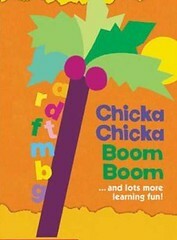 MTM - Chicka Chicka Boom Boom! It's Muffin Tin Monday time again! This week the scheduled themes started back up, with this week's assignment being "abc / alphabet". This classic is well loved in our home. Our books (yes, we have more than one copy!) are well worn, the Scholastic video is frequently played (you can see an excerpt to the cute video here! ), and we sing the song all the time! The alphabet cutters I used to cut the tiny letters out are from JList (you need all 3 sets for the whole alphabet). I like the ones from JList because they are plastic. There is no fear of rusting and I don't feel I have to baby them as much as I do metal cutters. This is incredible. The tree is amazing. I love all the letters. that is SUPER cute!! is that a regular size muffin tin or a mini one? :) my daughter's kindergarten class theme last year was chicka chicka boom boom. she loved it. and when the black eyed peas song "boom boom pow" came out, that became the class anthem. they changed it up a bit to be a little educational, it was SO adorable to watch them sing it at kindergarten graduation! What a cool tin. We love Chicka Chicka Boom Boom too. Bravo! This one is absolutely awesome!!! absolutely amazing. 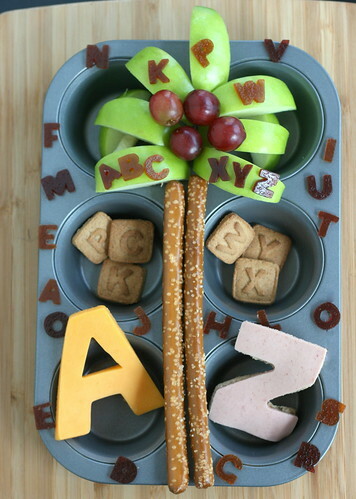 What I love is that it's not just creative, but also edible and something my kids would eat! That is so cute! What a clever way to make the tin! This is just awesome! Great Muffin Tin! That's GORGEOUS! Thanks for sharing. Thanks everyone! We all had a lot of fun with this one. :) And it was easy! YAY! So adorable! We love Chicka Chicka BoomBoom at our house too. Excellent! This was one of my favorite books when I taught preschool - bet it was a fun MTM to eat. Hi there! That's so adorable! I love chicka chicka boom boom. Have you seen the scolastic movies? they're adorable. This is super cute. I love your idea. Oh my gosh awesome!!!!! I absolutely love this!! It made me really happy to look at it! haha I loved reading that book to the kindergartners in the practicum class I did last year! Girl. You are amazing! 'Nuff said. P.S. I love what you've done with the place! So bright and cheery and CUTE. Just found your blog and am loving all the lunches!! Also, my son is in preschool this year and I just sent in his order for Scholastic books and am getting Chick Chicka Boom Boom for only $1! Glad it's coming so well recommended here, as I hadn't heard of it before I ordered it. Thanks again! fed up with lunch - Mrs. Q asks, I answer! YUMMY food giveaway & MORE! PlanetBox lunch with an edible nametag! announcing the Lunch Punch giveaway winners! Muffin Tin Monday - fit for a princess! it's time for a Lunch Punch giveaway! Muffin Tin Monday - stop, slow & go!